I just love when my nieces come to visit! Last night our 3 nieces and nephew (oldest) spent the night because yesterday was my little sister's 20th wedding anniversary! Early this morning our nephew and the middle niece had to leave around 8am for orthodontists appointments....which left my eldest niece (next month becomes a teen) and youngest (8) and me just enough time to prepare a pretty BREAKFAST TEA. Unfortunately we didn't have much time because those two immediately after had golf lessons to skedattle off to! I was busy preparing the food so had them decide together how to dress the table and this is what they prepared. I didn't change anything (ie "straighten" so a few things are "off" and it doesn't matter one bit! Didn't they do a really fine job? 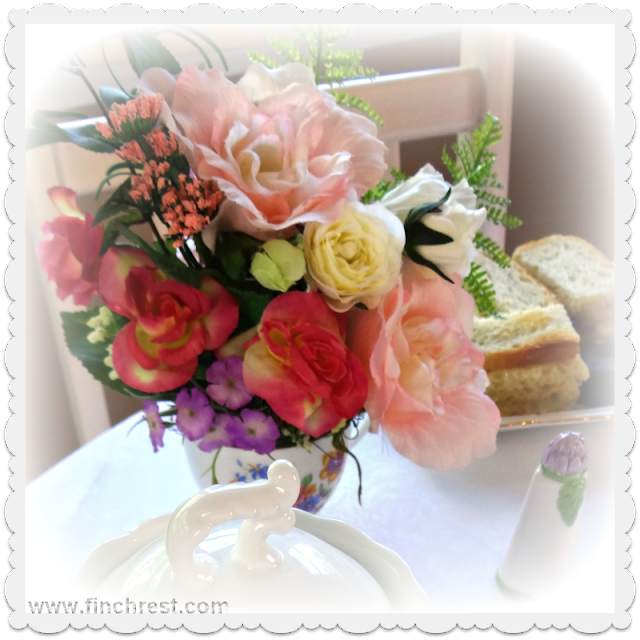 They chose one of my teacup silk floral arrangements to add a bit of color. I wish I had thought of letting them cut flowers from the garden. Oh well, next time perhaps! 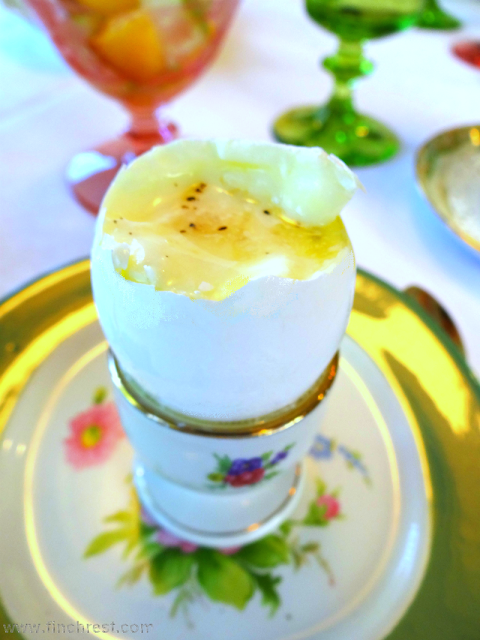 Our menu was a simple one of "English Eggs in a Cup," which they want EVERY time they spend the night. We also had fruit (peaches & pears) buttered toast fingers with jam, and 3 chocolate mini doughnuts that their brother earlier this morning couldn't finish. (The two who had to leave without a proper breakfast picked those horrible things for their own breakfast the night before on the way home from our seeing a movie.) Bleh. They picked out Harney and Sons "Paris" black tea - one of our favorites, delightful vanilla undernotes- highly recommend it! I know I am repeating myself, but worth doing so! If you have never eaten soft boiled eggs before, try it soon! They're delicious! You needn't have a fancy vintage egg cup, either -use anything (even an egg carton cut up) that will prop up the egg for you. ~Addendum: Brilliant idea from Kathy from Creative Home Expressions! She shared a great idea in her comment below. Butter toast, break it up in bit-sized pieces and put in bottom of a mug. Scoop out all the soft boiled egg onto your toasts bits. How perfect for Breakfast on the Go! Better for you than any drive-thru eats, for sure! A demitasse spoon works best for cleaning out the egg entirely, fits in the small egg well. We used vintage Noritake teacups. They're light as a feather. I have 4 of them but unfortunately have no matching teapot or plates. I shall have to keep a watchful eye out for more pieces! Let me know if you know of any available out there! 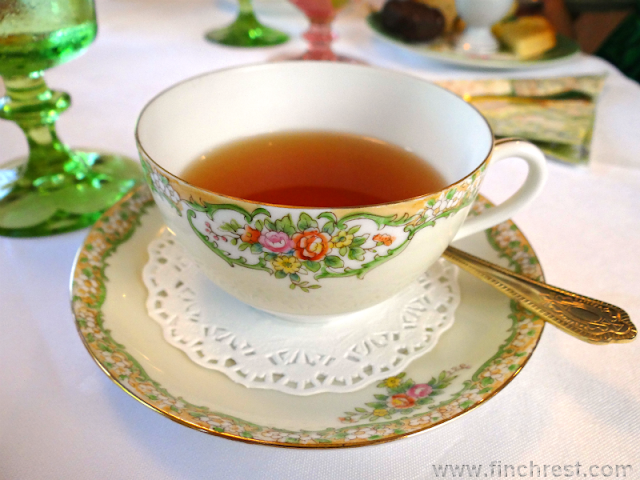 I do love the green rimmed plates they chose in which to pair these lovely teacups. Some folks bring eggs to room temperature. I seldom have time beforehand, so I never do so and have found it makes no difference that I can tell. Also older eggs work better so if you are getting close to an expiration date this is a great way to use up eggs and a pretty fun way to get some extra protein. * Fill a pan with water and put eggs in making sure the water is about an inch above eggs. * Bring to a full boil. * Remove from heat, cover and let stand 4 minutes for XLG or LG eggs, three minutes for medium sized eggs. * When timer goes off (do not let them cook any longer) immediately place in cold water to stop the cooking time. Don't let them get cold though, just stop the cooking. * Grasp egg firm and gently "whack" with a sharp knife at the thinnest top side about a quarter inch down to "open." Keep whacking and turning until the "top" comes off. * Put a tiny dollop of butter, salt and pepper on top and serve hot. 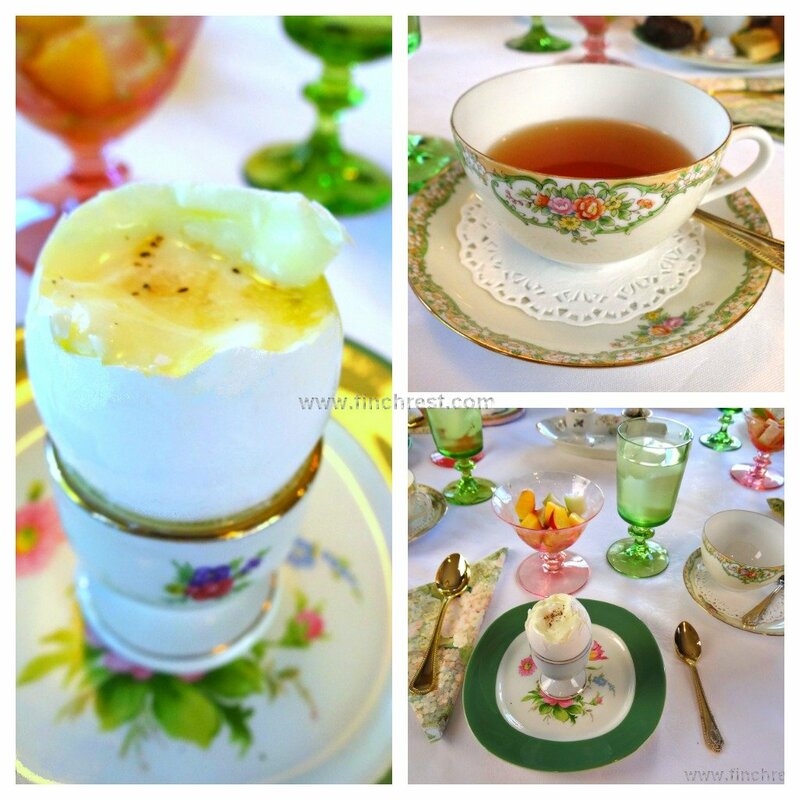 We always put the egg cap back on b/c there is egg in it, too, and tends to help keep the egg warmer longer as we are always fussing with tea once the eggs are at the table. it isn't considered proper to do so, but makes sense to us, and is our tradition to serve them that way. What a pretty table, Michele! They did a great job of it. I used to eat soft-cooked eggs a lot when I was little. My Mom always had the cutest egg cups. Thanks for reminding me! I also love that cute birdie teapot in your last post...ADORABLE!!! They did an awesome job! What a fun time you must have had. Your nieces are just like their Aunt!!!! They have learned so well from you! The table is just lovely and the eggs and tutorial are delightful. We use to eat those at all the bed and breakfasts we went to in Europe and loved them. Strangely I haven't made them since. I now have some egg cups and am going to try them. I love soft boiled eggs and I know my husband will enjoy these for sure. Glad you shared such a joyful event!! Wow what a great looking BREAKFAST TEA! The eggs look good enough to eat right out of the screen! Such sweet helpers ...and great style! very well done,Michele, I know you enjoyed their visit. Everything is very pretty! I'm going to your house for breakfast! The kids did a great job on the table. You've taught them well. :D :D Everything is so pretty and summery. 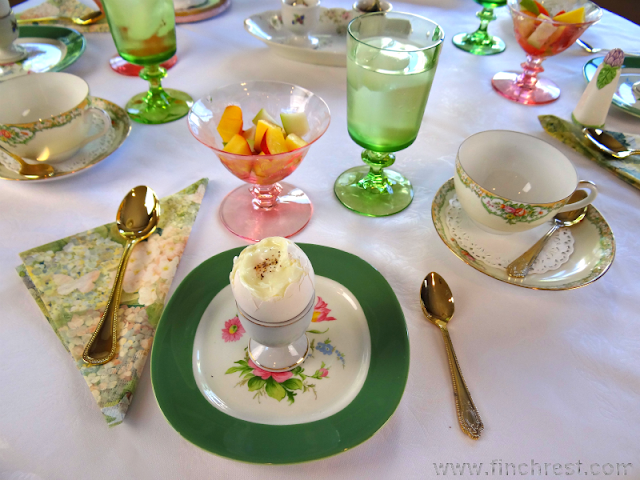 I love eggs -- any way.Love the pink and green glass and the Noritake teacups. Lovely! How fun, Michele! The girls did a great job setting the table. I haven't had a soft boiled egg in years. My grandmother introduced those to me when I was a kid and what she used to do is butter her toast than break it up into a mug. Then she'd scoop the soft boiled egg into that and mix it up with the toast. I remember trying it and thinking it was so delicious. AH- even better, then, if one doesn't have an egg cup! And actually easier in many ways! GREAT idea - never had them that way - actually a good way to get "breakfast to go!" Goodness this is gorgeous! The teacups are TDF!! Loving the green plates and flowers..I also like the pink splashes here and there. What a great job they did. Great brekfast too, love the Eng. eggs on the cute cups, our favorite kinda eggs. Enjoy your weekend with the kids. They did a wonderful job, it looks lovely. We had soft boiled eggs often growing up, served over little pieces of buttered toast in a cup. Nice memories!